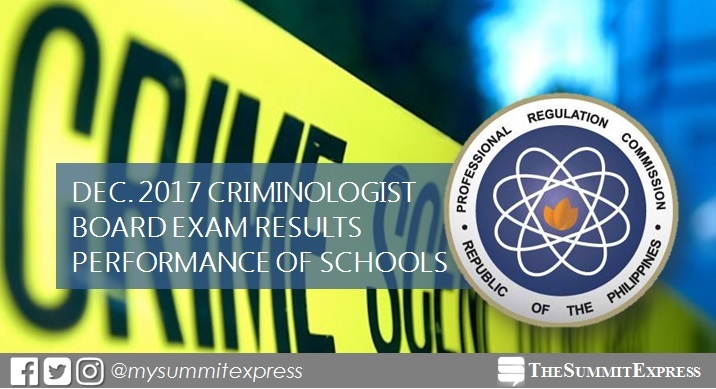 MANILA, Philippines - The Professional Regulation Commission (PRC) hailed the top performing schools in the December 2017 Criminologist licensure examination (CLE) or Criminology board exam. The result was released on Friday, January 12, 2018 or in twenty-one (21) working days after the exam. PRC conducted the CLE on December 8, 9 and 10 (Friday to Sunday) in Manila, All Regional Offices; Zamboanga, General Santos and Rosales, Pangasinan. University of the Cordilleras (UC) is consistently topping the Criminologist licensure exam in the past years. In the October 2015 and 2016 exams, UC led the schools with 94.20% and 95.16%, respectively.